Artificial Lawyer caught up recently with Dan Rubins, the Founder and CEO – and also the CTO – of Legal Robot, one of the new breed of AI-driven document review start-ups. We discussed how he moved from working in a medical services company to joining the fray as a legal AI pioneer, how working on smart contracts may be where the company eventually ends up and why there’s a big world of opportunity out there. The San Francisco-based founder of Legal Robot, Dan Rubins, is not a lawyer by background. But, his experiences have taught him a lot about the inefficiencies of document review, while his long term interest in technology and programming has also helped. Perhaps, most fundamentally, Rubins is a self-proclaimed engineer. And engineers fix problems. One such challenge was manual review and data extraction from legal contracts and he very much wanted to fix that problem. While Rubins had helped co-found a digital design business focused on e-commerce back in 2000, the intervening years between then and now have mostly involved working at several large companies. Most recently he worked at Fortune 500 medical services and IT company McKesson as a director of solutions management. The world of entrepreneurs often needs to say a prayer thanking companies for providing plenty of problems that really need a tech solution. That’s because such challenges help drive thoughtful employees to leave their desks and go out and create a solution. The company badly needed people to help organise, classify and understand what their hundreds of contracts contained and meant. That was fair enough, but the way they were doing it was incredibly laborious. Rubins left his job to set up Agnito Labs in San Franscisco’s Bay Area in July 2014. By the summer of 2015 it had morphed into Legal Robot. His co-founder is Megan Satterfield-Smith and the company now has a staff of three. The company has received investment from external funders. They had a $105,000 angel round in two tranches, one in November 2015 and one in March this year. The angel investors are Rob May, Ming Woo and Yegor Bugayenko. And there is more funding in the pipeline, with an $800,000 seed round in progress. Legal Robot may still be in a beta phase, but the company already has six major corporate clients, one of which is none other than one of the world’s largest companies: GE. In this case Legal Robot’s document review capability is being used by the US team in the Environmental Health and Science Division at GE. 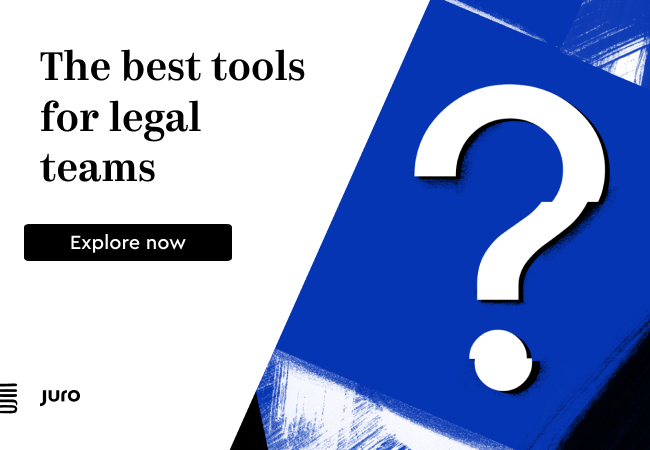 Legal Robot is also making use of its own proprietary machine learning and natural language processing (NLP) programs. Rubins had looked at what could be ‘bought off the peg’ from companies such as IBM Watson, but found that when it came to understanding Common Law legalese such standardised software wasn’t the best fit. Rubins notes that much of English-language legalese is formed from quite long and complex sentences with many clauses and the off the peg NLP systems didn’t always adapt well to this kind of language. Unlike some of the cognitive engines used for document review, Legal Robot is taking a multi-track approach, offering its review services not just for large scale document trawls to inhouse legal teams, but also helping individuals in corporates with small numbers of contracts. The system is not necessarily going to be used by lawyers inside these companies either, but could be used by executives who want to check issues such as compliance, internal rules on procurement or other forms of regulation. Another differentiator is the ability to input search queries in natural language sentences, rather than defining just with a key word, or always referring back to a group of pre-set search terms or clause types. Legal Robot also allows some interesting link-ups between the corporate client, an external law firm and the AI system. An example would be that a law firm has a legal compliance update that needs to be taken into account across a client’s contracts, for example the law has changed on data sharing. The law firm communicates the change in compliance rules to the inhouse client, which then automatically triggers Legal Robot’s cognitive engine to swing into action and search out any matters that are affected by the update. As one can see, the approach here to document review is adaptive and perhaps comes from an engineer’s perspective of not just solving the problem, but then seeking to improve upon the original solution. Rubins is open minded about where legal AI is going, especially in relation to contracts. He points out that at present the potential market is huge and the amount of legal work conducted by AI is tiny, even now after many firms have adopted it. He also adds that in such a huge potential market there is plenty of room for all of the legal AI companies at the moment. ‘There is no competition as such, every AI company is doing its own thing,’ he concludes. Maybe one day there will be some consolidation, but not just yet. ‘We want to be the company that helps convert contracts into smart contracts. That’s the end game,’ he states. But, before then, he notes that there is a big world out there to explore with AI document review and not just the Common Law, English-speaking world. Legal Robot is now looking at developing a Spanish language system that can offer the same NLP and machine learning capability across Central and South America. This is another huge potential market. That said, Rubins notes cracking clause review in Civil Law systems will not be easy, as the way contracts are worded is very different to Common Law. But, then, a few years ago Rubins had not imagined he’d be running a pioneering legal AI company. In which case there is no reason to think this multi-tasking engineer will not crack this challenge as well. Good to see what keeps you busy after McKesson, Dan. Have a great future! !